We produce guyed and self-supporting delta and flat towers for single, double and multiple circuit configurations ranging in voltages from 69 kV to 765 kV. Drawing on an extensive database of tower designs going back more than 40 years, we are able to expertly design and manufacture towers for all terrains, environments and operating conditions. 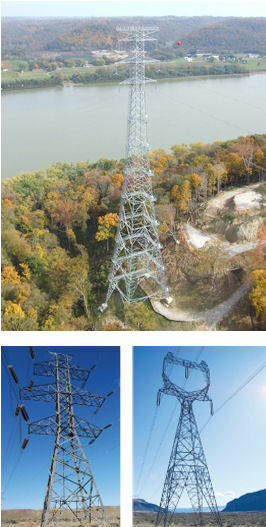 Our expertise covers the full range of tower types, including tangent and running angle suspension, strain and dead end towers. We are the go-to provider in the Americas for difficult river crossings and other complex challenges. All of our tower structures are optimized for weight efficiency and constructability in order to minimize total in-place cost. With more than double the market share of our closest competitor, we are the leader in the Americas. Our two state-of-the-art manufacturing facilities—located in Monterrey, Mexico and Belo Horizonte, Brazil—serve the Americas with 100,000 tons of annual production capacity. As part of KEC International, we have access to 174,000 tons of additional capacity available from three plants in India.